Seven Dials is a charmed oasis that’s not just about shopping – it’s home to merchants, artisans and cooks from all over the world. There’s culinary treasure on every street: ibérico ham, English cheese, Sicilian tuna, French macarons, Trappist beer, 20” pizzas, meatballs, escargots – just about anything a foodie could want is right there. Here are six reasons why you should have a wander round. I Love Nata is a case in point. It sells two products: coffee and nata (the celebrated Portuguese tarts). We love a good nata, but anyone on a mission to find one of the best in town needn’t go further than this shop. Pierre Hermé, the ‘Picasso of pastry’, sells legendary macarons and chocolates. They look as good as they taste. On the northern perimeter of the area is Nisbets, a place full of desirable things for the kitchen. It’s mandatory browsing for a foodie. Having made a wish list, walk back into Seven Dials via the juice stall on Earlham Street and buy a shot of nutritious wheat grass – said to be nature’s medicine. If drinking pure chlorophyll doesn’t appeal, just remember it’s supposed to be good for you. The cramped but convivial Monmouth Coffee shop is a famous Seven Dials institution. They’ve been roasting beans since 1978 and these days Monmouth is a full-scale retail operation and still bristling with infectious enthusiasm for its excellent coffee. It’s also the only coffee shop that understands how to make proper iced coffee. Or bask in the deliciousness of the Swedish bakery Fabrique for a traditional fika (coffee break) with a cardamom bun – how cardamom ended up in something so Swedish is a mystery, but the taste is a revelation. The bread is good too. For a good-value lunch try the sandwich specials at Canela. This stylish but easy-going Portuguese café is a cool place to take a break. Finish with coffee and another (also good) nata. Continuing the Iberian theme, wander to Enrique Tomas, the jamón shop. If you hang about inside the shop, you’ll be offered slivers to taste. Further hanging about (along with appreciative lip-smacking) will elicit even more tastings – at which point you may feel compelled to buy some ham. Do it – it’s all first-class. More Iberian treats for a foodie can be found across the road in the Basque tapas bar Pix. When asked for a favourite, the manager suggested the tortilla – he’s right: the simplest is often the best. Seven dials is packed with places to eat: from the everlasting Mon Plaisir to the ever-popular Polpo; from the cheap and tasty meatballs at The Bowler to the expensive and tasty British steak at Hawksmoor. You will find dozens more restaurants offering food from around the globe. Kopapa, Peter Gordon’s fusion restaurant is a must. Breakfast is fun and reasonable – try the Turkish eggs – an inspired adaptation of Levantine cuisine. 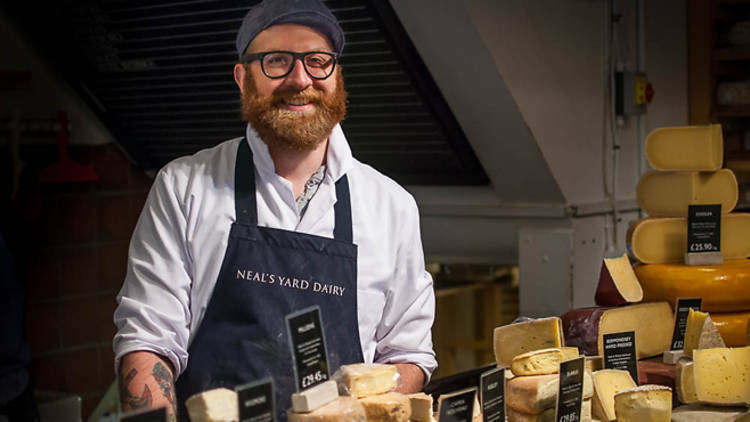 Neal’s Yard Dairy has cheerful and knowledgeable staff: all are happy to offer (yet more) tastings and guide you to the best cheeses. Try the cute wheels of Bis made in nearby Bermondsey, or the Sleightlett, an exceptionally fresh goat’s cheese from Somerset – with just a hint of goat. Final word goes to the new boy – and girls – on the block, Casanova & Daughters. They specialise in Sicilian pasta, olive oil, herbs, tuna, anchovies, passata and much more. It takes a little time to accommodate to the singularity of the shop, but try some of the produce, then it will all make sense. Use your fingers to release the fennel aromas of ‘Africa’ basil flowers – we tried it on our carpaccio of salmon recipe. 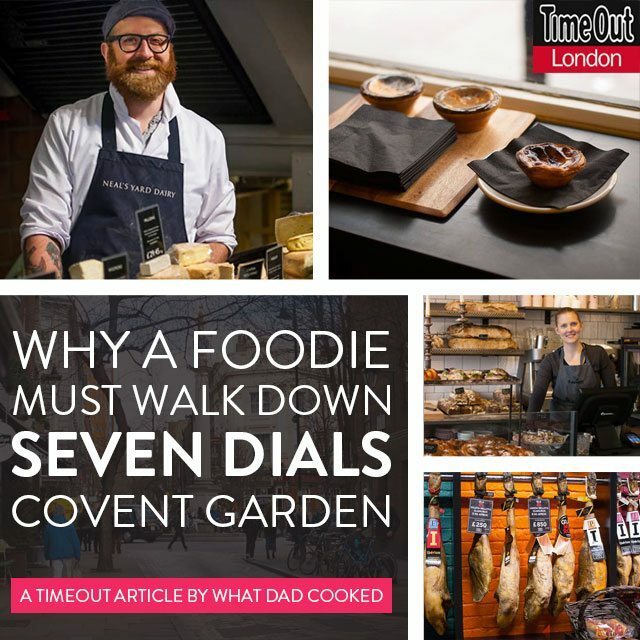 Find out more about what’s going on in Seven Dials by visiting their website here. Have a read of Why You Must Walk Down Lower Marsh or read Why a Foodie Must Walk Down: Bermondey Street & Square on TimeOut.